The Rajabhat Institute of Chiang Mai was the venue for the 6th annual Thai Boxing contests. 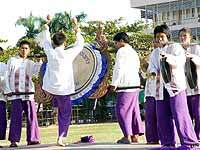 This show also marked the celebration of the 80th Anniversary of Rajabhat of Chiang Mai. Glong Sabudhcai (victory) drum and gongs called the competitors forward to do battle. The Thai Boxing was not the only entertainment on the bill, as there was the Thai cultural festival, with the highlight being a huge Thai hot-air balloon. The main event was a bout in the 72-73 kg class between Ram Bongs’ Pimnimit Sitaran and Canadian Alex Richy, who won the title on points. Other bouts were held between Akhom Dejpunrij and Wong Cheng Yo (from China), Pornsawan Kiet-Bussaba vs. Jonathan Rudolf (Slovania), Yodchat Veva Sport Gyms vs. Bleck Tomlinson (New Zealand), and Lom Esan P.M.C. Gyms vs. J Jeffy (USA.). As in previous years, the highly successful Nimmanhaeminda Art and Design Promenade will take place in the lane adjacent to Chiang Mai’s longest-established first class property, the Amari Rincome Hotel, from December 4 -7. Organizers, participants and helpers after the press conference for this year’s Art & Design Promenade. Sponsored by the Tourism Authority of Thailand, Thai Airways International, Amari Rincome Hotel, Chiangmai Mail, Passport to Suvannaphoum Magazine and Sean Kahm Terrace, around 80 beautifully decorated booths will line both sides of the small lane, displaying an alluring array of hand-made high quality products, including ceramics, furniture, silks, textiles, rattan, bamboo, candles, lamps, jewelry, paintings, carvings, paper, batik, leather, pewter, silver, and many items not normally found in traditional tourist outlets. The annual fair therefore allows visitors to experience the unique craftsmanship of a large number of Chiang Mai’s small shops, studios, potteries, galleries and workshops all within a leafy lane less than 200 meters long, and enhanced by numerous cultural presentations, fashion shows and concerts. Two of the models showing a sample of the upcoming costume jewelry fashion show, directed by Dr. Troy (Dent. Nawapoomin Chaichompoo) - a breathtaking performance. Local and international artists give performances that include dance, drama, puppetry, and piano. Generous prizes add to the excitement, including free round-trip tickets on THAI Airways to Yangon (Rangoon) and Luang Prabang. The opening ceremony, presided over by TAT Governor Juthamart Siriwan, will take place at 6:30 p.m. on Thursday December 4, and include an exotic Lanna-style show, plus an impressive procession of Buddha images. On subsequent days, the fair will operate from 10 a.m. - 10 p.m. until closing on December 7. Adding further to the enjoyment, the Nimmanhaeminda Art and Design Promenade coincides with the local celebrations of H.M. the King’s birthday on December 5. Entrance is free, and the fair is suitable for all ages and nationalities. Because of the variety of goods for sale, and the high standard of entertainment, many people enjoy making repeated visits during the four days of fun-filled festivities. The photographic section of the Faculty of Fine Arts, Chiang Mai University (CMU) with the cooperation of Central Airport Plaza, is promoting an exhibition of images to allow viewers to have an opportunity to appreciate some aspects of Thai arts and culture, with images of Chiang Mai City, hence the title, Muang-Muang. The display is in the Northern Village Center of the Central Airport Plaza. Sanhajuta Jirathiwat (3rd right) and Assoc. Prof. Thada Martin (2nd left); the vice president for Finance and Assets, CMU at the inauguration ceremony of the exhibition. Today, the role of photographic art has evolved into our daily life. The photographs in the exhibition are recording the stories from the past as well as the present, especially in the context of Chiang Mai City, which has its own character in art and culture as well as being a tourist center in the northern area. A team project to improve neonatal results and develop mother-baby relationships has been honored by a BUPA Blue Cross award. A pediatric team from the special care medical service center, Chiang Mai University, won the top sponsorship award of B. 150,000 for their project which developed management guidelines for mother and baby from pre-marital counseling to post-natal care. Their work resulted in fewer complications during childbirth, and enhancing mother and child relationships. Dr. Andrew Vallance-Owen (left) presents the 1st prize award to Dr. Wicharn Laowittaya, director of special medical service, Chiang Mai University. The 2nd place award of B. 100,000 was presented to Theptarin Hospital which developed a diabetes camp to help patients and their families manage diabetes. 3rd place and winning B 50,000 was Samitivej Srinakarin Hospital for its project: “Multi-disciplinary approaches to the management of childhood obesity”. The money must be used to develop these projects further. The winners are also expected to share their results with other hospitals and medical schools in the kingdom. At the award presentations, Dr. Andrew Vallance-Owen, BUPA Group medical director, said he was delighted that a complete, professional roll call of clinical disciplines were participants in this first ever event in Thailand. He added how happy he was to know that the panel had chosen such a worthy Thai government teaching hospital this year. Concluding the ceremony, he said that he believed that the number of medical institutions entering the Bupa Blue Cross Excellence Award would grow substantially each year, as Thailand continues to promote the finest health care possible for its citizens. Chiang Mai has had the privilege to welcome two world-class musicians, Atsuko Watanabe (violin) and Naoko Kato (piano), performing at Vichit’s treasure cove (Gong Dee Studio). The organizers were indeed pleasantly surprised that almost all seats were taken. Speaking on their behalf, Hagen Dirksen, Honorary Consul of the Federal Republic of Germany, expressed his delight over Chiang Mai’s response to the sometimes ambitious undertakings to organize a not so mainstream event. 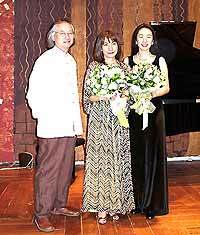 Conductor Hikotaro Yazaki, conductor of the Tokyo Symphony Orchestra and honorary conductor at the Bangkok Symphony Orchestra, his wife Atsuko, and Naoko after the successful concert. In his opening address, Japanese Consul Saburo Sato said how proud he was that two musicians from his own country had found their way to Chiang Mai, after having enjoyed praise for their recent concert in Bangkok, which was honored by the presence of HRH Princess Galyani Vadhana. Violinist Atsuko Watanabe is a graduate from the Tokyo National University of Fine Arts and Music, and a member of numerous national orchestras world-wide. Besides her classical and romantic repertoires, she also introduces a number of Japanese and French contemporary works in her concerts and recitals, and she is noted for her incredibly full and rich sound, which seems as if she is playing more than one violin. Pianist Naoko Kato received a Bachelor’s degree in Japan, and her Masters degree in Chicago, both in Piano Performance. She is an accomplished performer and one can enjoy her presentations at the Bangkok Opera, as well as the Bangkok Community Theater. Together, they have established a reputation of being totally synchronized, which was immediately obvious from the first piece of the evening. Japanese composers were also featured, including Tore Takemitsu and Tokuhide Niimi. The evening ended with Hon. Consul Hagen Dirksen presenting a donation of 60,000 baht to Nareumol Panthong, wife of Chiang Mai’s vice governor, which included the proceeds and private donations towards the Center for Mentally Retarded Children. Ajarn Xavier Pitijet Vichitporn, music director, and Duangtida Dilokwutisit, the GM of Baan Chulasai announced regular Sunday Music in the Garden matinees. Baan Chulasai is situated in the middle of the city, with a huge garden and a teakwood house over 80 years old. 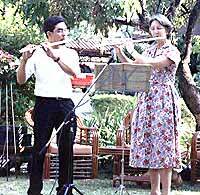 Ajarn Xavier Pitijet Vichitporn, music director at Baan Chulasai and Ajarn Annette George from the music department of Payap University during their flute duet. The first Sunday matinee performance was a flute duet performed by Ajarn Xavier and his special guest, Ajarn Annette George from the Music Department at Payap University who played pieces by Heinrich Soussmann (1776-1848). These music matinees are reaching out to the community who enjoy art, culture and music as a pleasant way to spend Sunday afternoons. 10 percent of the 180 baht admission fee (which includes tea, coffee, sandwiches and brownies) will be donated to scholarships for deprived or handicapped children to allow them to study at Baan Chualasai. Some may feel with external influences and technology, that the making of traditional crafts has been lost or forgotten in the rush to meet world market demands. Not so, as many Thai talents are proving design leadership sanctioned by watchful world eyes. While some Asian countries are concentrating on mass-producing trinkets, Thailand is rapidly becoming known worldwide for its strength in well-designed, distinctive products. Vision and tradition are brilliantly blended in contemporary concepts at many Thai companies. The contemporary relies on traditional skills, while established skills are enhanced by modern interpretations. Aka-Walai Gallery & Tea Room - trendy stoneware. Chiang Mai, Thailand’s major northern city and area, boasts an amazing amount of gifted craftspeople. In days of yore, the old capitol of Lanna (land of one million rice fields) remained in isolation due to its hilly terrain. Even after access by railroad appeared in 1921, the long journey seemed prohibitive to many travellers from Bangkok and other points southward. Western and urban influences were minimal and villages such as Sankampaeng noted for its celadon and Ban Tawai woodcarvers and furniture makers continued their traditions of fine craftsmanship as they had known it. 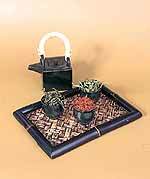 Locally found clay fashioned water jugs with simple decoration, homespun cottons woven into basic blankets and clothing coloured with natural dyes were produced by craftspeople with little thought of artistic value, prefacing function before form. These traditions still hold true today. Made also as souvenirs, supplementary income results, preserving traditions of rural life in contemporary times. Neo Glass - glassware for modern living. “Despite the immensity and magnetism of Bangkok, despite the phenomenal growth of provincial capitals in recent years, modern Thailand remains predominantly a country of rural villages, where the great majority of its 60 million people derive a living from some form of agriculture. There are regional differences, of course, some of them significant, but it is at this level that one discovers the essential Thai social values and also its most enduring crafts,” states William Warren and Luca Invernizzi Tettoni aptly in their book Arts and Crafts of Thailand. Add to the already concisely sorted time-honoured crafting techniques - younger trendy minds, having experienced urban life, design schools or perhaps time abroad observing Western wants, and behold - explosive cutting edge designs. Still functional but fresh - the emergence of craft as art. Absolutely astonishingly endless ideas. Retail, wholesale and export shoppers can choose from traditional handicrafts to an ever-changing, expanding array of skilfully crafted contemporary pieces including ceramics, textiles, clothing, soft furnishings, basketry, jewellery, furniture, metal ware and paper. All suitable for home, office and gift giving. It is a world constantly awakening to finely designed and executed works of art. Time-honoured heritage and innovation brought together - balanced in their own strengths of beauty and style. Traditionally contemporary, perfectly blended.